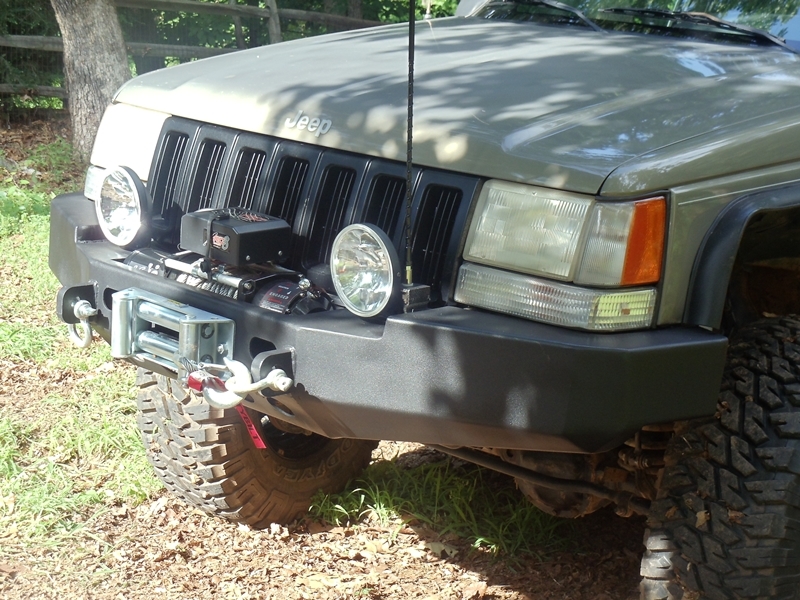 This bumper replaces your Grand Cherokee (ZJ) OEM bumper with the welded strength of steel. Price shown is the base price for this bumper, and is fully customizable so that you can include the best options that are important to you. This all steel construction winch bumper has been designed to provide the lowest profile/approach angle to improve your off-road, rock-climbing performance while still supporting a mountable winch in a strong 1/4" steel winch box. The tough, integrated design ensures that the winch is protected and provides for optional fully welded tow points and other accessories. Another design feature is the "wide-track" profile which gives an added level of protection to your vehicle, extending beyond the fender and tires to shield your Jeep from canyon walls and trees on the trail. This bumper also comes standard with reinforced supports and gussets to add additional rigidity to the structure to withstand those occasional bumps against trees and canyon wall. This can help save you from damaging your fenders and doors. The droop design in the grill area follows the classic Jeep design line features on this classic Jeep Grand Cherokee. All welds are ground and finished to give a professional, high quality appearance. Made with the highest quality standards by experienced craftsman using the latest technologies to ensure a precise fit every time. Our bumpers are 100% made in the USA by American craftsman!